Thanks to the armoire, turtles, and Ruth I'll be making even more Christmas stockings for Stockings for Soldiers. The armoire: When we moved the armoire this week I had to find new places for the things that were housed in that piece of furniture. When I started opening drawers in my sewing room I came across some squares of Christmas fabric that I bought back on Day 185. (A whole stack is right there in the middle of the third row in that day's picture.) How I forgot about having them I'll never know. But now that I've rediscovered them I'm using them with some other red, green, and white scraps from Day 273 to make even more patchwork-y stockings. The turtles: When I finished up all those big turtle pillows for The Painted Turtle Camp on Day 154 I had lots of odd shaped pieces of fabric leftover. I tucked those pieces away thinking I'd use them in some way. 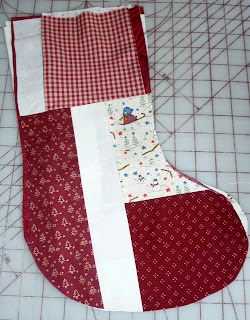 Today I cut them into more workable pieces and am combining them with the Christmas squares for more stockings. Between all those scraps, strips, and squares I think I can probably get at least a dozen more stockings with the scraps I have but I'll still be short of my goal. 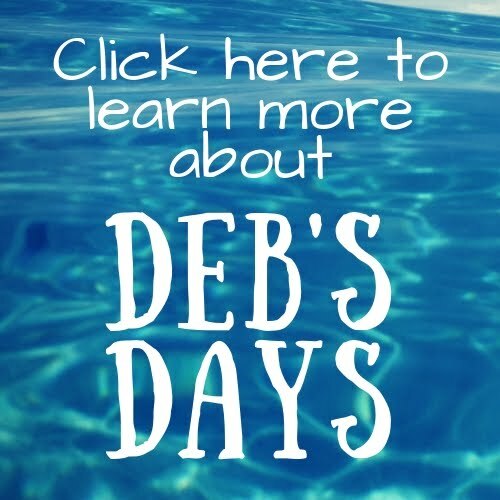 And then along comes Ruth, a reader of this blog. She e-mailed me, offering to send more Christmas scraps my way. Of course I took her up on her offer. Thanks a bunch, Ruth! With all that, I've made two stockings so far today. These patchwork-y ones take so much longer than if I was using yards of fabric, especially when I'm combining Christmas squares and fabric strips and ovals from the insides of turtle shells to come up with a Christmas stocking. But the time it's taking me doesn't matter. The only thing that does matters is that this stocking will be hanging on a soldier's wall in Afghanistan at Christmas.